This is the best place to find peace and relaxation. It's a wonderful experience everyday. 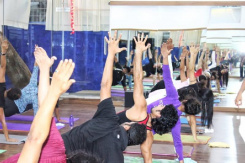 Its a wonderful affair to be a piece of Akshar Power yoga academy, the classes are exceptionally well and all around organized, every session is extremely all well composed and extremely all around conveyed under the direction of our Master Akshar sir. My travel with APY institute began one and half years back however I was rehearsing yoga before yet the genuine importance and its right definition was given to me Akshar sir. 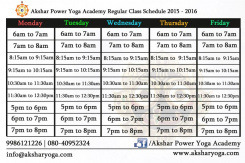 Its a great feeling to be a part of Akshar Power Yoga Academy. They have multiple Branches in Bangalore. I have visited the Hebbal center. Its the one stop place for health and philosophy related things. I joined Akshar Power Yoga Academy for trainer certification. Its is worth the money and time. One of the best institute for yoga in Bangalore. They are good at almost all Pranayams, Asanas, Mantra Chanting & Philosopy of Yoga. If you are interested in Yoga, you can definitely join this institute. Yoga classes are very good. I had joined for Teachers Training in Yoga(TTC), an it was a good experience. But their administration needs to be improved, Getting my class certificate wasn’t an easy task. The look of the academy is absolutely nice. This is the ideal spot to the ones that occasionally feel unsatisfied with the lives they have. I went there to learn yoga, as well as I learn philosophy and how to live in a different way. This is an excellent institute with perfect experts. I am really happy and I recommend this to everybody. Akshar is a best coach and provides good training classes. For basic yoga classes APY provides good infrastructure, but they need to improve more for good hygienic place and also need to improve on individual attention for best service.